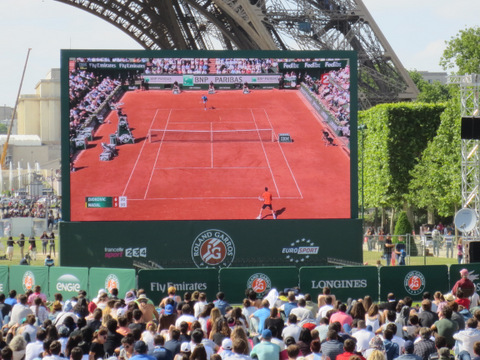 PARIS has a tradition of free public entertainment, including the French Open tennis tournament. 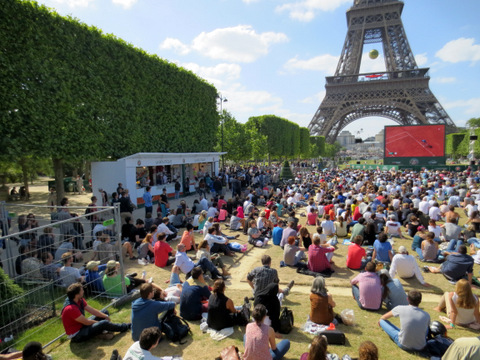 For years, spectators could go to downtown Paris to watch on a large screen in the open courtyard of City Hall, but this year the screen moved to the large open lawn in the shadow of the Eiffel Tower, on the Champs de Mars. On Wednesday I went to the Tower to check it out. The usual large crowd bustled around the ticket windows while, fifty yards away, grifters and their confederates — mostly thimblerig and friendship bracelet scammers — prospected for gullible tourists. A hundred yards away the lawn fenced off for tennis fans was almost full. A souvenir stand, much like those at Roland Garros stadium, attracted only a few customers. A fenced area nearby, which looked like a long batting cage, gave would-be Nadals or Djokovics a chance to test their serve against a speed gun like the ones used at the real stadium. While I was there, no one came close. 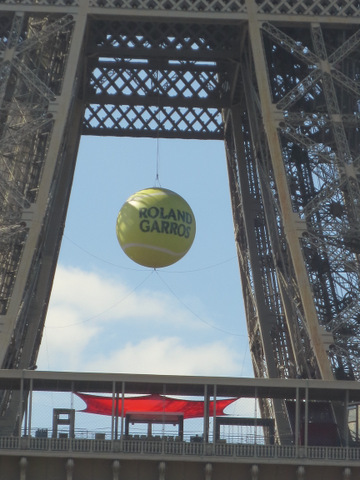 In honor of the tournament, the Eiffel Tower management hung what looks like the world’s largest tennis ball between the second and third floors. It’s hard to miss. If you look closely at the tips of the arrows in my picture below you’ll see the glint of the sun reflecting off the blades of the new wind turbines installed at the 400-foot level. The vertical-axis turbines are designed to power the commercial parts of an entire floor, as this article from The Verge explains well. The Guardian has more information about the turbines and the other steps the Tower’s management has taken to reduce its environmental footprint. 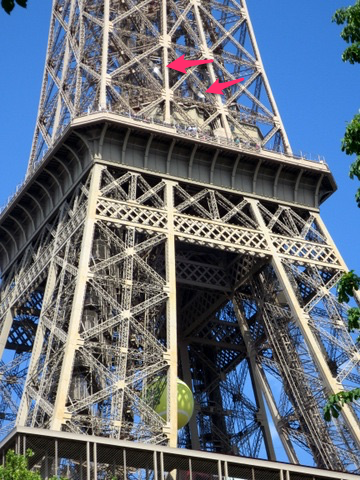 Sun glints off the Eiffel Tower’s wind turbines, at the end of the red arrows. How did one of the world’s four major tennis tournaments come to bear the name of an aviator who died almost a century ago? Garros is credited with designing the first workable way to allow a fighter pilot to fire a fixed fuselage-mounted machine gun without hitting his own propeller blades and shooting himself down (it used metal wedges on the blades to deflect the bullets). He was also the first person to cross the Mediterranean Sea by air. Wikipedia has a good account of his life and times. He was shot down and killed a month before the end of World War I.